Pixel Scroll 7/21/18 Number Five: Where Am I? Other Number Five: In The File. (1) THE MAN WHO LOST THE MOON. Where do you hide something this big? “Giant moon artwork goes missing in post on way to Austria”. A giant replica of the moon which is displayed all over the world has gone missing in the post. The 7m (23ft) orb, covered in detailed imagery of the lunar surface, has been created by Bristol-based Luke Jerram and was en route to a festival in Austria. Courier firm TNT said it was looking into the issue. Mr Jerram said the artwork has been booked for a series of public events across Europe over the summer. (2) FUTURICON. Rijeka, Croatia is going to host Eurocon 2020, which will be called Futuricon. Their bid was accepted this week at Eurocon in Amiens. Their site has been home to Rikon for almost two decades. Rijeka, the coastal city in Croatia in which the annual convention Rikon has already been held nineteen times, has won the prestigious title of European Capital of Culture 2020. As part of the ECoC nomination, the SF society 3. zmaj, is announcing Futuricon, our bid for Eurocon 2020, for which we will combine the most important things the city of Rijeka has to offer – centuries of culture, diversity and tolerance, and a fresh glimpse into a positive future created by the people who live and breathe culture. With the support of the City and University of Rijeka, as well as other Croatian SF societies, we are confident that we can create a unique European experience for everyone. (3) ALWAYS IN STYLE. Debra Doyle, novelist and editor, makes a statement “With Regard to the Recent Email to Nominees for the Hugo Awards”. (4) THE MORE THINGS STAY THE SAME. You may not have thought the question of what Worldcons want people to wear to events was a new controversy. But would you have expected E.E. “Doc” Smith to be the person complaining about it? In 1962? 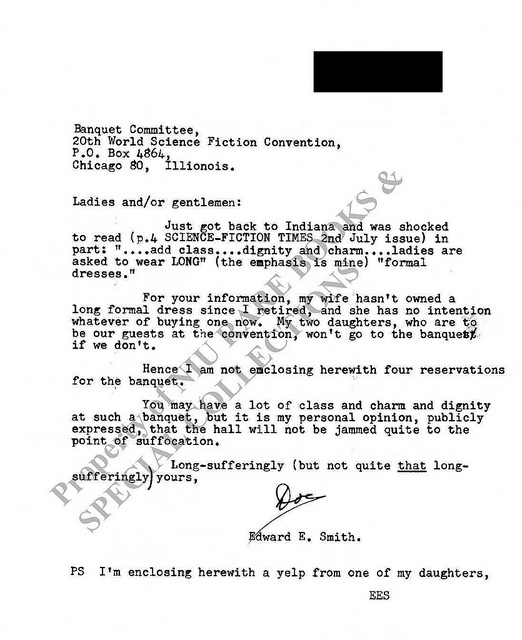 Here’s a letter the author of the Lensman Series wrote to Chicon III chair Earl Kemp before the con. (5) ONE BIG CHECK. That’s what you’ll be writing if you want any of his stuff — “One giant sale: Neil Armstrong’s collection goes to auction”. ABC News has the story. Admirers of Neil Armstrong and space exploration have a chance to own artifacts and mementos that belonged to the modest man who became a global hero by becoming the first human to walk on the moon. The article names several other flown artifacts that will be in the auctions. (6) ACCLAIMED SHORT FANTASY. Rocket Stack Rank lists 46 outstanding stories of high fantasy from 2016-2017 that were either finalists for major SF/F awards, included in “year’s best” SF/F anthologies, or recommended by prolific reviewers in short fiction (see Q&A). 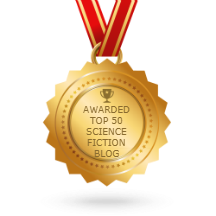 That’s 46 out of 166 high fantasy stories from those two years, and out of 470 outstanding SF/F stories from 2016 and 2017. For our purposes, we define “high fantasy” as a fantasy story that takes place in a secondary world. That is, something like Lord of the Rings, where Middle Earth is clearly not in the past or future of our world. (7) ADDRESSEE UNKNOWN. 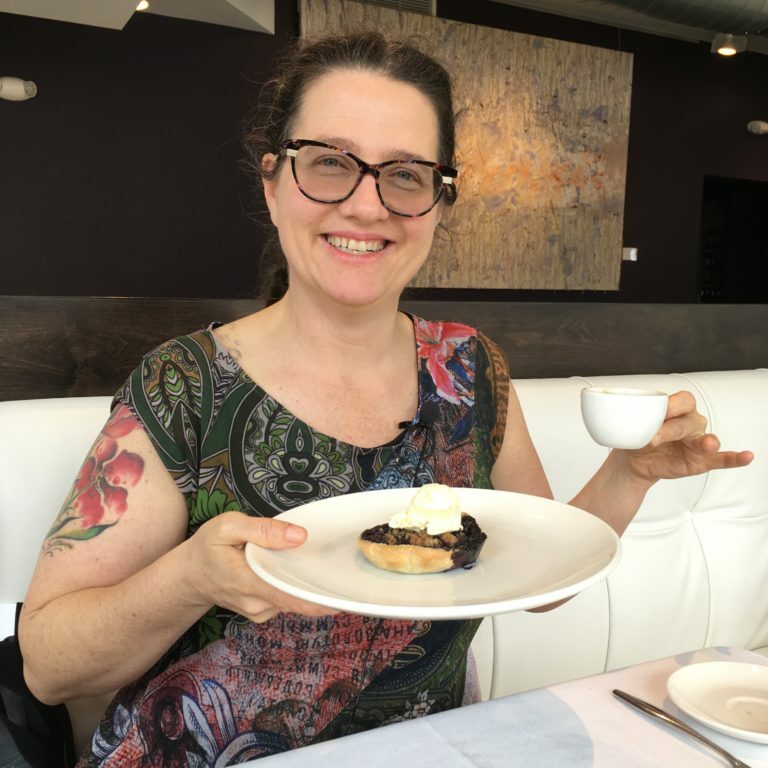 There was just one problem with choosing John Crowley as the winner: “Maine Literary Award withdrawn because of ineligibility; new winner named”…. The winner of a 2018 Maine Literary Award was found ineligible because he is not a resident of Maine, and the Maine Writers & Publishers Alliance, which gives the awards annually, has named a new winner of its speculative fiction prize. “Ka” was nominated by the editorial director of Saga Press, a division of Simon & Schuster, whose marketing manager told the Maine Writers & Publishers Alliance that Crowley owned a home in Maine and lived here part time. Crowley, who was born in Maine, was named the winner of the award in a June ceremony. According Joshua Bodwell, executive director of the Maine Writers & Publishers Alliance, Crowley notified the group that he did not live in Maine. While the award can go to seasonal or part-time residents, it is open only to people who live in Maine. Crowley reached out to say that he was unaware that his publisher had nominated him or that his publisher and his editor had said he met the eligibility requirements. (8) STOPPING FOR ICE. Galactic Journey’s Ashley R. Pollard tells about the latest trend in fiction 55 years ago: “[July 21, 1963] Ice Cold Spies”. I marvel at how quickly SF concepts have gone mainstream. With so many SF ideas transitioning into mainstream fiction, one of the current trends I see is the fascination with the Cold War and spies. Who as I’ve alluded to earlier, are it seems to be found everywhere. The result is the creation of a new genre that blend SF with contemporary thriller to create what is being called a “techno-thriller.” A techno-thriller will use many of the ideas that were once purely science fictional, but set them within a conventional world that’s recognizable as our own. A new novel by Allister MacLean called Ice Station Zebra has caught the public’s imagination. Whether this is as a result of all the stories of spies in the news I don’t know. MacLean is well known as a writer of action-adventure stories, but this new novel sees him move into a new genre. Maclean is not the first author to do so. Fellow Scottish writer Ian Stuart wrote a similar techno-thriller, which came out last year called, The Satan Bug…. (9) A PAIR TO DRAW TO. SYFY Wire’s SDCC story “Guillermo del Toro confirmed to guest on The Simpsons in season 30” that confirms the celeb writer/producer/director Guillermo del Toro (The Shape of Water, The Hobbit trilogy, the Hellboy movies and games, and many more) will guest star on The Simpsons this coming season. He joins Gal Gadot (the Wonder Woman movies and others in the DC Cinematic Universe) in the “confirmed” column. There was apparently no indication the two would be on the same episode. The season’s first episode of their 30th season will will air September 30. … with a live stage show. Indeed, there is going to be a live stage version of Sharknado. No details were offered at the panel, other than it is expected to premiere at a resort/casino in 2019, and will be a sensory overload, if you will. An official announcement is expected later this year. (11) HELL WARMED OVER. You may recall that Lucifer, canceled by Fox at the end of this past season, was picked up by Netflix for a 10-episode 4th season. At SDCC, star Tom Ellis dropped a few hints about what might be coming up after the major season 3 cliffhanger. SYFY Wire wraps up stories from other sources in “Lucifer’s Tom Ellis Teases Season 4 on Netflix”. “We get straight back into it,” Ellis told TV Line of the start of Season 4, and teases that Lucifer was unaware that he had the devil face on at the time, so Chloe’s likely shock will come as a surprise. The pair are “apparently” still working together, but Ellis added that “The weird thing this year about coming to Comic-Con is that I can’t talk about the show and what’s going to happen so much, because I don’t know.” The scripts haven’t been written yet, and production begins August 13. Netflix has yet to announce a premiere date…. There were hints that Ellis could drop trou on Netflix, something that would have been Right Out on Fox. (12) SHAZAM! Let’s catch up on our comic history before watching the trailer: “DC’s ‘Shazam!’ Makes a ‘Big’ First Impression in Comic-Con Trailer”. And for those of you asking, yes, he really is the first hero called Captain Marvel, debuting 20 years before Marvel Comics existed as a brand. Fawcett Comics was sued by DC in the early 1950s over claims that “Captain Marvel” ripped off “Superman,” and went temporarily out of business after it agreed never to publish the character’s comics again. However, in 1972 DC licensed “Captain Marvel” from Fawcett and brought the character into the DC universe. But during the intervening decades, Marvel realized the trademark on the name “Captain Marvel” had lapsed, and introduced its own character of the same name. Which is why, to avoid legal problems, DC called its re-launched comic book “Shazam” and eventually changed the character’s name outright. (13) SDCC TRAILERS. Here are several more trailers that got released this weekend. (14) GRAND BOOK THEFT. These weren’t books he checked out. Now he may be checking into the pokey: “Men accused of stealing $8M in rare books, items from Pittsburgh library”. Two men are facing charges of stealing or damaging more than $8 million in rare books and materials from the Carnegie Library of Pittsburgh over more than two decades. Investigators on Friday charged Greg Priore and John Schulman with the crimes, alleging the two men worked together to remove the items from the Oliver Room. According to the criminal complaint, Priore worked as the manager and sole archivist of the library’s Oliver Room, which houses rare books and items, for 25 years before being fired in June 2017. Schulman is the co-owner of Caliban Book Shop in Oakland, which specializes in rare books. The Oliver Room closed more than a year ago once authorities discovered the thefts. Priore first contacted Schulman about the scheme in the late 1990s, according to the criminal complaint. Priore allegedly told police he made between $500 and $3,000 for items he stole and gave to Schulman to sell. (15) BE ON THE LOOKOUT. Lou Antonelli, who was slated onto the Hugo ballot in 2015, mourns his “Lost Rockets” [Internet Archive link]. …I decided I’d start wearing my pins this year, and I took them with me when I went to SoonerCon in Oklahoma City June 22. After I checked in and got my badge, I took them out and I was going to stick them on. I took the first one out, and as I tried to stick it on, I fumbled it. I never saw it land. It disappeared. I never saw it again. I put the second one back in its bag. The next day, I realized I’d lost it also. (16) JANELLE MONAÉ. Rolling Stone lets you “Watch Janelle Monae Perform ‘Americans,’ Talk Science Fiction on ‘Colbert’”. Video at the link. During the 10-minute interview, Colbert and Monae also discussed their shared love of science fiction, which heavily influenced the singer’s new LP Dirty Computer. (17) ONCE MORE WITH FEELING. I ran this link yesterday before seeing Mike Kennedy’s take, which I think Filers will enjoy seeing just the same. In 2016. the British Antarctic Survey asked the public to pick the name for their new survey vessel. They picked Boaty McBoatface. Well, the BAS was not particularly happy with that, and named the craft the RRS Sir David Attenborough, though they did relent and name an autonomous underwater vehicle Boaty McBoatface (the lead vehicle of its class). The European Space Agency and the UK Space Agency are asking the public for help naming an upcoming Mars rover to be launched in 2020 (and land in 2021). You get three guesses what the public wants so far (and the first two don’t count). Yep, Time Magazine notes that Rovy McRoverface is already trending on Twitter. Gizmodo throws in Marsy McMarsface and Spacey McSpaceface as their suggestions. But apparently ESA and UKSA did learn at least a little from the Boaty McBoatface incident, since they say that they’ll be using a panel that they appoint to make the final choice. Or, at least they do if you dig deep enough into their 5-page PDF of Terms and Conditions. With no mention of this on the page where you make your recommendation, it would be easy enough for someone to misunderstand and think this was a straightforward popular vote.